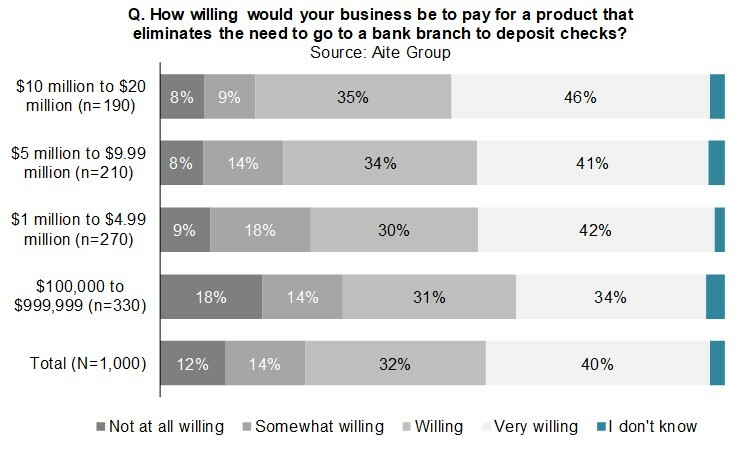 There is money to be had in the small-business banking space for banks with the right mobile deposit strategy. Boston, November 28, 2017 – Far too many U.S. banks continue to treat small businesses as consumers by offering consumer-oriented capabilities, limiting their ability to deliver products with a value proposition that warrants fees. Mobile deposit is one such product that is not delivering its full potential to the small-business community. This report explores small businesses’ key needs and preferences around mobile deposit and recommends ways banks can position themselves to succeed with these businesses. Sponsored by Deluxe Treasury Management Solutions, this report is based primarily on the results of a June to July 2017 Aite Group survey of 1,000 U.S.-based small businesses generating between US$100,000 and US$20 million in annual revenue. This 19-page Impact Note contains 13 figures. Clients of Aite Group’s Wholesale Banking & Payments service can download this report, the corresponding charts, and the Executive Impact Deck.